With screwthread connections (except air condensers). A condenser designed to give turbulent flow in the water jacket with a comparatively slow rate of flow of coolant water by use of a small annular space. Condensation of materials with boiling points above 150°C can be carried outwith this type of simple condenser. The surface area is considerably greater than the corresponding Liebig condenser of similar dimensions. The coil condenser is extremely efficient in the reflux mode where counter-current cooling is possible. QC4: two coils which are independent of each other. If desired they can be fed from separate water supplies. With increased surface area and effectiveness compared with a corresponding Liebig condenser. Used for standard Inland Revenue test and control methods by brewers etc, the Inland Revenue condenser employs the use of coolant flow outside the coil. This condenser is very efficient but must not be used for fast rates of distillation. It is particularly useful for removing condensable vapours from non-condensable gases. A double surface condenser having a coil as an inner cooling surface. This type has approximately twice the surface of a plain double surface condenser of the same effective length. An inexpensive condenser, giving greater surface area than the corresponding Liebig type due to the bulb sections. This type is normally used under reflux. Suitable for condensing very volatile liquids such as ether. 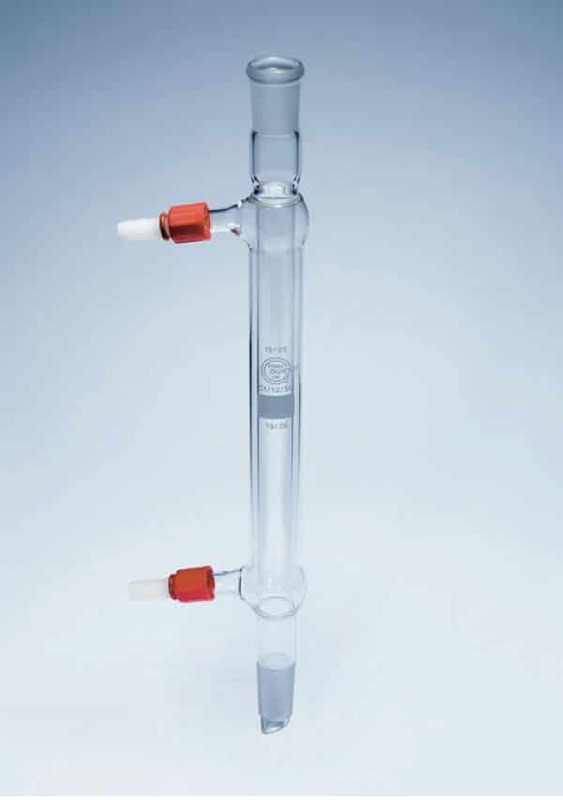 A general purpose cold finger condenser which can also be used as a dephlegmator to control reflux ratios in a rough fractional distillation. 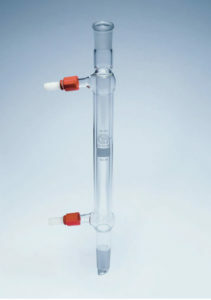 1-piece apparatus incorporating plain stillhead, liebig condenser and receiver adapter with vent. Reduces set-up time, air leakage, joint seizure, use of clips or clamps and grease contamination.